Packaging for multiple bars of soap, bottles of lotion, shampoo and conditioner. Packaging for men's products. 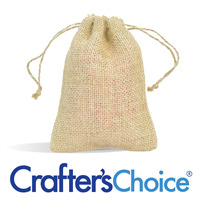 Natural color, burlap bag with drawstring close. Fill bag. Pull drawstrings to close.